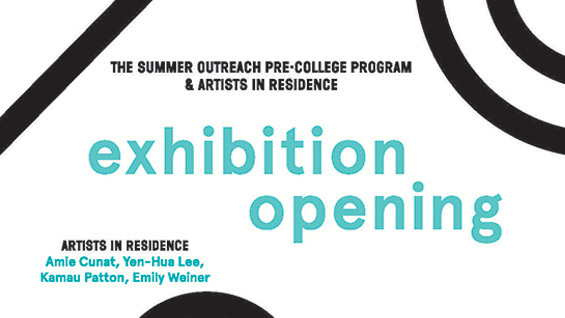 On Thursday, August 7, the Summer Outreach Pre-college Program will host the opening reception for their student and artists-in-residence exhibition. The reception will be held on the 2nd, 5th, and 6th floors of the Foundation building from 4-6 PM. The exhibition features works by high school students from the 4-Week Drawing Intensive Program, the 6-Week Pre-college Program and this year's Artists in Residence Amie Cunat, Yen-Hua Lee, Kamau Patton and Emily Weiner. We are profoundly grateful to Jacques and Natasha Gelman Foundation. We gratefully acknowledge our other generous donors: The Altman Foundation, Surdna Foundation, National Endowment for the Arts and Milton and Sally Avery Arts Foundation.